I never thought I’d see the day when a yellow 1820s frock would beat a blue 1910s one in rate the dress ratings, but last week’s historical+classical+paisley number far eclipsed the blue grecian from the week before, with a score of 9.1 out of 10 to the blue’s 8.7 out of 10 – and those last few decimal points to break the 9 point barrier are the hardest to earn! This week we’re borrowing the two elements that lost the most points for last week’s frock: the sleeves and hem ruffle, and seeing if they can win the day in a totally different frock. 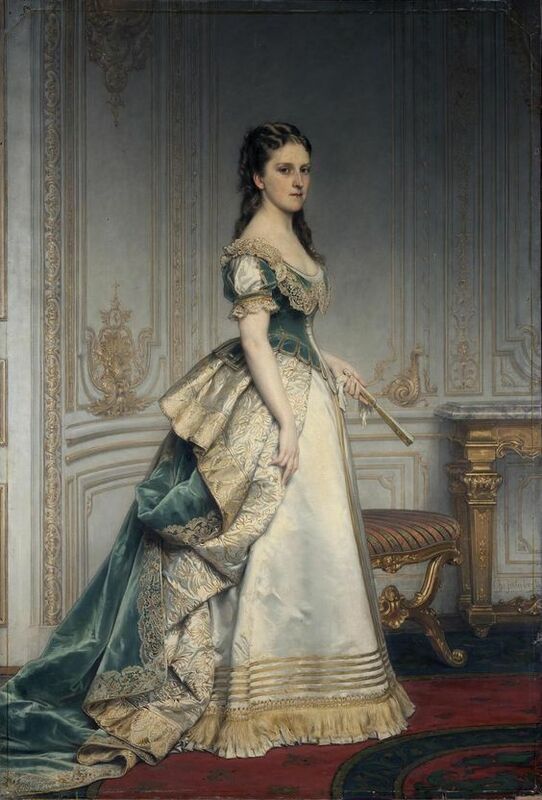 This early 1870s portrait shows Russian heiress Nadezhda Polovtseva in a luxurious evening dress (probably for a court occasion) with definite elements of historicism. Her sleeves, like those of last week’s dress, have a Renaissance inspired ‘slashed’ effect, and her tabbed bodice looks back to the 17th and 18th centuries. Her bustling and folding back of her train is also a nod to 17th and 18th century mantua and court trains, but also does an excellent job of showing off the elaborate lining of her train. Nadezhda Polovtseva was the adopted/foster daughter of Russian banker and arts patron Alexander von Stieglitz, Baron Stieglitz (and, according to popular rumour, the illegitimate daughter of Grand Duke Michael, which would make her the great-grandaughter of Catherine the Great). The 18 year old Nadezhda married Alexander Polovstev, a mid-level Russian noble, making him very rich, and suddenly very in favour with royal family. Nadezhda’s connections (*cough* her uncle Nicholas I) resulted in Polovstev rising in political power. He become Russian Secretary of State in 1873 – right about the time this portrait was painted. Both Polovstev and Nadezhda were cultural patrons in their own right. Polovstev was very influential in the founding of the Russian Historical Society. Baron Stieglitz had founded the Stieglitz Museum of Applied Arts and Central School of Industrial Arts in St Petersburg, and Polovstev and Nadezhda did much to add to the museums collections, and support the school. As a patron of the arts, Nadezhda had numerous portraits of herself painted by any notable artist who visited Russia. This particular work may have commemorated her husband’s glittering new position, or may simply have taken advantage of access to French artist Jalabert’s proximity. Based on other portraits of Nadezhda, the facial likeness is quite accurate, but there is something about the connection between face and body that makes me suspect a body model stood in for the rest – or perhaps Jalabert was having a bad day! However, we’re not here to rate Jalabert’s painting, but to consider Nadezhda’s outfit. What do you think? Wow! A 10 for me. The gown is just weighted with wealth and glowing with prestige. I love that blue and the tabs on the bodice remind me of conquistadores, explorers and such. Just one question–how does one sit in a gown like that? I like it a lot for the draping and the lines. I feel like the white satin skirt is just a little too plain, and could have stood to be done in a pattern or something a little more detailed, as you have an abundance of unornamented, plain (but gorgeous) sea-blue velvet and then another expanse of unornamented, plain (but gorgeous) white satin.. I almost feel like I want to see more of that gorgeous lining to the train spread out over the underskirt, even if just a few motifs from the pattern or some tracery leaching out to bring the two together, as for the era, it kind of looks almost like there is a part missing from the front. (Although I think I detect vertical rows of braiding down the centre front, so I think maybe if we could see them properly it would work better to help harmonise, and make the historicism of the overall design even more deliberate. I find this beautifully composed (particularly like the “Three Musketeers” dash of the bodice tabs), and the use of trim judicious (none of the “ME! ME! ME!” fighting for attention). The colors are serene without being drab. Court gowns usually leave me cold, but I like this one. It’s not excessively wide through the hips, and the train seems almost reasonable (or as reasonable as a train can be). I like the embroidery and fringe at the bottom of the dress and the white-and-gold brocaded lining of the train/overskirt. My major quibble is the color of the velvet of the overdress; on my monitor it looks like a dark bluish green, a rather drab shade. That might be the fault of the painter, or of time’s effect on the paints he chose, or even my monitor itself, it’s hard to tell. On the minus side, the laced overbodice gives this very high class gown an oddly discordant peasanty note (at least to my eyes). I’ll agree with Daniel: 8.5 out of 10. So I know it’s Victorian and they were all about heavy trim, but the bottom really reads as the fringe on the bottom of a couch or something. Everything is so thick, and heavy, and over the top. It’s gorgeous, but it’s just not my fave. I’m really loving this streak of very beautiful and not-too-controversial dresses you’ve been posting 😛 I want to wear this dress so much! I’m honestly not trying to be not-too-controversial! I never know what people are going to love or think is terrible. I’ve posted dresses I thought were divine, only to have them bomb, and ones I thought were so cliched and blah, and had everyone rave about them. I was SO surprised (but thrilled!) that last week’s did so well. Yellow and 1820s are not usually crowd pleasers. Long may it last though! Stunning! The color is subtle and intoxicating — not at all drab to me! Nothing less than a 10. If I could pick a new skirt for this gown I’d give it full marks, I just love the colors and embroidery/ brocades of the bodice and train. But the plain white skirt culminating in those very stark stripes for trim (plus the fringe)– meh. I looked at this dress a few times in the past days, read several enthusiastic reviews, but am not at all convinced of the beauty of this dress. I always like a 70’s silhouette, the train is nice, but it is just too much. too much historical references, too much styles, no consistency. The sleeves, the train lining, the hem decoration, the lace, it’s all over the place. And I do not wish to discuss the tabs, as I might write some very unladylike words doing so. The dress will get a pass for the overall silhouette and the lovely cream-blue color combination, though. I love Russian court dresses, and this one is no exception. That train and the lining! Just exquisite. The blue chosen for the bodice denotes rank, and it’s a lovely shade. The use of gold, white, and blue, as well as some simpler elements to balance out the heady glory of that court train seems right on the nose. Another enthusiastic 10 from me! Can I have it? Pwease? Its soooo preeeetty. Love, love, love the colour scheme. The colours on my monitor make it a sea-foam, white and gold combo which looks pretty amazing. Once I get past the colours though… I’m rather ambivalent about the whole ensemble, but there’s fringing over pleating so that get’s it an extra point. 10! 10/10! I don’t care that the skirt is apparently a slipcover from the ’90s with a curtain on the back. It’s so gorgeous. I’d wear it in a second. It’s gorgeous! And completely over the top, of course, but it’s a court gown, it’s not meant to go grocery shopping! On my monitor, the velvet reads as a slightly blueish tinted green. I love the revealed lining of the overskirt. I agree with you that the painting looks like the head and the body were done separately. To me it looks like the head is at a slightly different scale the body. But this is not about the painting, it’s about the dress. Hands down, it’s a 10/10! I LOVE it – except for the fringe, because I never like fringe, but even that coordinates well with the rest. I’m particularly impressed with the double-sided train, and I wish we could see it’s full length. I also think the plain white / cream underskirt is a good choice; a pattern would take away from the train and make the contrast less impactful, plus I just don’t like an excess of trim / pattern/ everything all at once. I love this! I give it a 10. My favorite part is the use of the heavy velvet and brocade (or is it quilted?) overskirt on the bustle. It is simply beautiful the way it lays. 10! I love the colours and the textures are glorious. The silhouette is also beautiful! Such a lovely colour combination, it’s such a regal dress. I’d give it 10 but I hate frills it would look so much better without it. It would be nice to see what it actually looks like without the frill if photo shopped. I agree that the skirt looks a little bit plain and unadorned. You have this line of pattern on the lining of the train, separating a big plain blue from a big plain white. I also don’t think the fringe is working here. It looks a little out of place, especially since it’s just on the hem and nowhere else. I feel like lace would tie it together better. Next PostScroop Patterns is an Indie Pattern Month Sponsor!